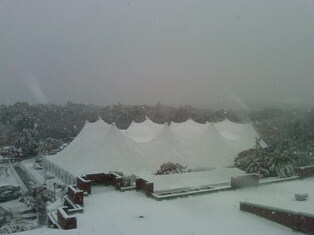 In-Tents: Brrrrr. It's Cold Out There! Brrrrr. It's Cold Out There! There is always an element of stress, worry and anxiety when planning a party or major event. Did I invite the right people? Will everyone get along? Did I order enough food? More importantly, did I order enough wine? Yet during the winter, new levels of stress and worry begin to come into consideration. But what if you could? During the winter months, porch enclosures and outdoor tenting provide homeowners with the additional space they desperately need for a large gathering. By attaching heaters to these structures, extra rooms are created within hours, without the fuss or muss of a renovation crew. Hanging strings of lights around the perimeter or poles help create a cozy area where guests can chat or catch up. Once you add a few cushions or benches, you have created an intimate lounge in your backyard! While you still may worry if the music is too loud or if your guests get lost even with your directions, you do not have to worry about overcrowding in your living room. Don’t hesitate to ask us about maximizing the space on your property by taking advantage of winter tenting…and winter pricing!